South Africa's governing African National Congress (ANC) has dismissed reports of a plot to oust President Cyril Ramaphosa, calling them blatant lies and shameless gossip. South Africa's Sunday Times said it had evidence that senior ANC officials were plotting with the country's former President Jacob Zuma. 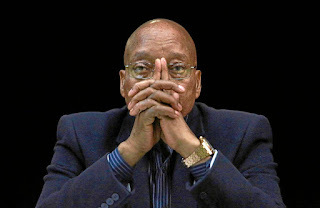 The paper published a photo, showing what it said was a secret meeting last week between Mr Zuma and several key allies - and claimed the group was preparing a campaign to remove President Ramaphosa from power. The ANC swiftly condemned the report as lies and shameless gossip. But the party's chief whip, Jackson Mthembu, said the alleged plot should be taken seriously, and warned of the deep factional battles still raging in the party. The ANC has defended President Cyril Ramaphosa, saying nobody will succeed in changing the outcomes of the party's national conference held in Nasrec, south of Johannesburg, in December. At that conference, Ramaphosa replaced Jacob Zuma as ANC president. "Nobody, whether inside or outside of the ANC, will succeed to change the outcomes of Nasrec. The majority of delegates at Nasrec decided to have this leadership led by President Ramaphosa," ANC national executive committee member Zizi Kodwa said on Monday. Mr Zuma was forced out of power last year and is now facing a corruption trial and other investigations. His successor, Mr Ramaphosa, is still struggling to consolidate control over his party and to revive a struggling economy, ahead of national elections next year.